What are the benefits of TMS therapy for depression treatment? What are the benefits of TMS therapy for depression? There are many benefits of TMS therapy for those of you battling depression. Here we explore the benefits of TMS therapy and how this treatment option offers a safe alternative for you to consider. If you have been diagnosed with Major Depression or Bipolar Disorder and your body has either rejected other medication or you cannot tolerate its side effects, consider TMS therapy. TMS therapy was approved for use in Australia by the Therapeutic Good Administration (TGA) in 2007 and is also endorsed by the Australian and New Zealand College of Psychiatrists. This means that TMS is a very safe treatment option. It is a very well tolerated treatment as there are only a few side effects that are relatively mild or considered as low risk. The most common side effects are minor headaches, which can easily be managed by taking mild paracetamol, such as Panadol or Nurofen. It is a medication-free alternative. This means that TMS therapy does not cause side effects that are associated with medication. This includes weight gain, reduced sexual functioning, tiredness, reduced memory and concentration and stomach pains. 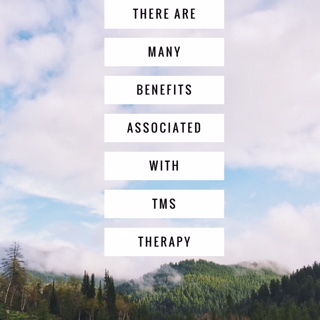 TMS therapy is a non-invasive treatment that does not involve any surgery. You will remain awake during your session and because it is such a tolerable treatment, you can relax and watch TV, listen to music or talk to a family member or friend. You can also continue on with your daily routine straight after your session. Through more extensive use of TMS technology, we will learn more about the potential benefits of TMS and drive more research and development.